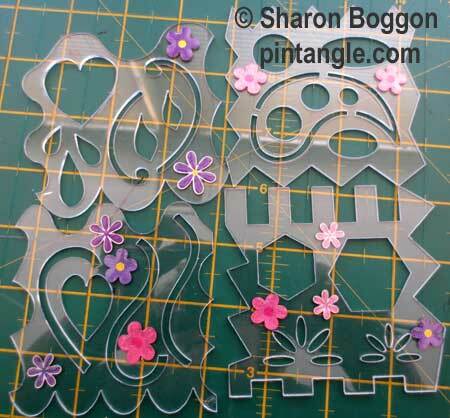 Home Sharon B's CQ Templates I have been decorating my stencils! I have been decorating my stencils! I was contacted by a very well known crazy quilter (she will fall about laughing when she reads this) She asked if I had thought about making my cq templates, still transparent but coloured. I answered I had but it was going to cost more. In order to keep the costs down I selected a clear plastic. Of course I asked why and she told me so they don’t get lost on the work table. Well … I could not imagine losing the templates so to be honest did not think too much about it. Then the other day sure enough I was working and could not see for the life of me the template I was using! I turned everything on the table over, looked under things and generally got annoyed. Then bingo I saw it next to my coffee cup. Ha! it was payback for feeling smug. Serves me right, but I smiled and decorated my templates with some cheap stickers. Floral ones to remind me of the person who made the request (she likes floral motifs) and so I can find them easily on my work table! I love your stencils, thanks for the tip ! Ha Ha, That is a good idea. But I lose books. Although if I ring one of my friends and ask if I loaned lost book to them it will always turn up… somewhere that I had already looked here too. I am chuckling away here at everyones comments! My (several) work areas always end up looking like a mad woman’s breakfast, so I make a point of sliding my templates into the envelopes and cover you sent them in……..But hey I can still manage to misplace the A4 sized folder that the templates and notes are stored in. Another object to hang pendant-wise around my neck???? LOL! Sounds just like me. Especially when embellishing I lose things right in front of me. I also have put stickers or tape on my clear rulers etc. Glad to see it isn’t just my addled brain! Your blood’s worth bottling Sharon for that idea. I thought it was just my faulty eyesight. I have some wee Christmas stickers that are just right for the stencils. What a great idea I just found No.3 after 4 days of searching. It was sitting on the work table right next to me. I think I will get fishies. I color mine with permanent marker Orange my favorite color. I learned this after losing a VERY EXPENSIVE long – arm ruler that I use all the time. I still haven’t found that darn thing for over 2 years. I didn’t get the stencil that I bought. You have an expected delivery? Vania I have sent you an email as I sent them when you purchased them. Must buy stickers!! I’m keeping my stencils in a folder that has the printout – but anything can happen when I take them out to use them. What a great idea. I have a few clear plastic geometry templates and will stickate them. Glad you had such a great trip in Europe. That is a good tip – logical – why didn’t we all think of doing that 🙂 ? Allie Aller sprang to my mind:) Thanks Sharon – a. for keeping the cost down b. for the handy hint above. Haha.. sounds like Allie Aller to me…? I am not admitting anything! Now, this is wonderful, I am laughing. I am even marking my rulers like that, with red circles – it is so helfpful. I know what you mean! I bought a set before Sharon went traveling and then couldn’t fid them. Turned my craft area upside down to no avail. So, when she returned, I bought another set. Then, i stumbled on the first set, safely stored in a place I swear I searched before! I keep mine carefully folded in the flral papers they came in now!